TS CCLA Posts sanctioned in New District Collectorates, Revenue Divisions, Mandals: Telangana CCLA Various Posts Sanctioned. 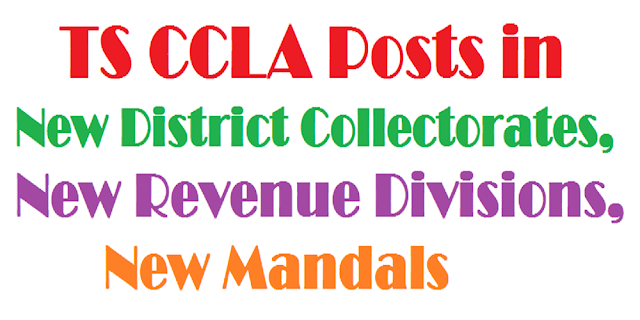 TS CCLA Jobs in New District Collectorates, Revenue Divisions, New Revenue Mandals. Chief Commissioner of Land Administration post. Reorganisation of districts has brought in cheer for youth of Telangana with the state government deciding to make recruitment to meet the demands of the new districts. The T state government has sanctioned 2,109 posts in key departments. According to GO.186, the newly-sanctioned posts will be filled through direct recruitment. The Finance department has accorded sanction for the creation of 2,109 posts in revenue department alone under the Chief Commissioner of Land Administration. The GO said 693 posts would be filled in the district collectorates which includes 12 district revenue officers (DROs), 98 tahsildar cadre posts and 180 senior assistants. Telangana government sanctions 2,506 posts in Revenue department: The Telangana Government has accorded sanction to fill up 2,506 posts in revenue department. The CM directed Chief Secretary SP Singh to make immediate arrangements to fill up these posts. The posts include Deputy Collectors-08, Deputy Tahsildars - 38, District registrars - 07, Sub registrars -22, VRAs- 1,000. VROs- 700, Junior Assistants/ typists -400, surveyors - 110, junior assistants in registration department -50, junior assistants in CCLA - 21, computer draftsmen- 50, deputy surveyors - 100. These posts are in addition to the 137 posts sanctioned by the Finance department on Saturday. The number of posts to be filled in the revenue divisions is 188 of which 24 RDO (revenue divisional officer) posts, 24 divisional administrative officers, deputy statistical officer and deputy inspectors of survey have been sanctioned.In the revenue mandals, the total number of posts to be filled is 1,228. Of this 104 tahsildars and 104 deputy tahsildars, 232 mandal revenue inspectors, 120 mandal surveyors, equal number of assistant statistical officers, junior assistants and 308 office subordinates would be filled soon. Officials said that the respective departments have been instructed to finalise the number of posts to be filled through direct recruitment. G.O.Ms.No.186 Dated:19.10.2016. Government Of Telangana, Revenue Department -Formation / Reorganization of Districts, Revenue Divisions and Mandals - Creation of two thousand one hundred and nine (2109) posts under Chief Commissioner of Land Administration, Telangana, Hyderabad - Orders - Issued. Read: Revenue Department, U.O.No.21167/Ser.I/2016, dt: 21.09.2016. ORDER: In view of the formation / reorganization of Districts, Revenue Divisions and Mandals in the State of Telangana, Government hereby accord sanction for creation of two thousand one hundred and nine (2109) posts under Chief Commissioner of Land Administration, Telangana, Hyderabad, as shown below. 1 District Revenue Officer (SGDC) 52590-103290 12 Existing 9 posts of Addl. Joint Collectors are re-deployed and existing 8 posts of Special Deputy Collectors(KRCC) are hereby suppressed. 2 Tahsildars cadre 35120-87130 98 Existing 3 posts of Tahsildars (KRCC) are re-deployed and existing 30 posts of Deputy Tahsildars(KRCC) (LR) are hereby suppressed. 12 Chowkidars/Watchman 13000-40270 53 10 Chowkidar posts re-deployed. 2 Divisional Admn Officer (Tahsildars cadre) 35120-87130 24 Existing 8 posts of Deputy Tahsildars(LR) are hereby suppressed. 3. The Revenue Department is requested to take necessary further action in the matter accordingly.